The Falkirk Wheel is the "only rotating boat lift in the World". Because of its scenic location, unique design and elegant rotary movement it is also fast becoming a tourist attraction, though many people outside of UK are still unaware of this marvel of engineering design. In July 2005 I passed within a few miles from it and now regret not seeing it. Located near Falkirk, Scotland it transfers boats to and from the higher elevation Union Canal and lower level Forth & Clyde Canal. These two canals have an elevation difference of 35 metres. Earlier boats used to traverse these canals through a series of lock gates but these gates gradually detoriated and were abandoned in 1930s and the two canals remained separated. With the opening of the Falkirk wheel in 2002, boats can now traverse between these two canals with a graceful movement which is breathtaking for the spectators. I will not go here into the technical details of the Wheel which can be found in references given later but it is worth while to note that the system is very energy efficient and only 1.5 units (KWh) (same as a medium sized electric kettle) of electricity is consumed to move the well balanced caissons by 180 degrees in less than 4 minutes. Each caissons can accommodate up to four 20 metres long boats, and have a combined weight of about 600 tonnes. This is the view of the upper level aqueduct leading to the Union Canal. View the video to see the full sequence of transfer of boat from lower to upper canal and vice versa. 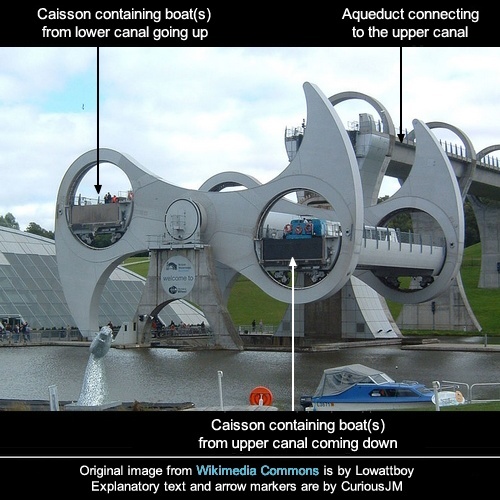 More info: Wikipedia and Official Web site of the Falkirk Wheel.